Tristram Marine lost their popular 641 Avant Garde moulds in a factory fire but out of the ashes came the new Tristram 641 Offshore. The new model has a greater focus on fishing while maintaining the brands exceptional finish, versatility and many clever touches. Family is important at Tristram Marine. It's a family-owned business built on family values so it's not surprising that Tristram Marine treat its customers like family. Central to a happy family unit is clear communication and Tristram Marine actually listens. Listening to its customers requirements and using their ideas in its boat designs has paid dividends with a trophy cabinet boasting an impressive display of both Boat of the Year and business achievement awards. Managing director Lance Fink says Tristram Marine prides itself on going the extra mile for its customers and it's the finishing touches like the brass keel strip and anchor docking fairlead that keep its customers coming back when it's time to upgrade. Fink says 40 percent of Tristram Marine sales are from repeat customers with one client now onto his seventh consecutive purchase. A devastating fire at Tristram Marine's Te Rapa factory in March 2010 destroyed the original 641 Avant Garde moulds but the company has turned adversity into triumph. Tristram Marine saw the rebuild as an opportunity to improve on what was already a good design by completely redesigning the deck and topsides. The proven 641 Avant Garde hull was resurrected to the exact same design that has remained unchanged since 1998. Fink summarises some of the many new features which include a bigger cockpit. "We've added twin back-to-back seats which are fully-moulded to the floor and moved the windscreen and dashboard further forward to allow more cockpit space. We have redesigned the dash so it's capable of flush-mounting a 12-inch screen. "We've also added a toe recess and live-bait tanks to appeal more to fishermen, flushed in the boarding ladder and added teak to the gunnels. Shifting the capstan back for trouble-free operation, the fuel tank has been moved forward to cater for the heavier, modern outboards." The new 641 Offshore was officially launched at the Auckland on Water Boat Show in September and has been well received with 15 boats already built in just three-months. Bruce Masefield owned a Tristram 641 Avant Garde for two and a half years. When he heard about the new 641 Offshore he called into Tristram Marine's showroom and fell in love with the new model. He's now owned Conundrum for a couple of months and has already put over 20-hours on the clock. Quality and finish are important to Masefield which is why he's another repeat customer happy to sing Tristram Marine's praises. "I like the quality of Tristram boats and think they've got the best finish on the market. With the features on this boat I've also got everything I need in a mid-sized trailer boat." Masefield says the fishing room on offer in the new 641 is the predominant reason why he chose the design but says the boat works for him on a variety of fronts. "I especially like the fact that I can lie down and stretch out in the cabin. The new bait board is a far better design over the previous model, as too is the angle of the rod holders and the toe recesses in the cockpit." Masefield predominantly uses his 641 Offshore for fishing and will often head out on the boat alone in search of fish for dinner. He says the 641 is easy to manage on his own with a little prior preparation. He's rapt with his new rig and says Tristram is always professional and excellent to deal with. The 641 Offshore has been designed to appeal to anglers of all types and possesses a few must-have features for the serious fisherman. 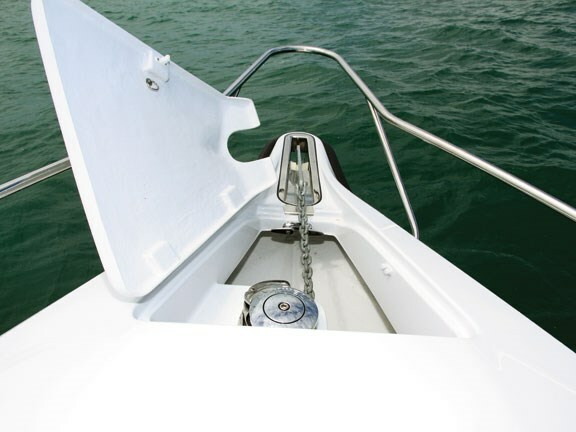 The cockpit is spacious, uncluttered and, thanks to a fully-moulded fibreglass cockpit liner and self-draining cockpit with an automatic bilge pump, it's very easy to keep clean. Carpet lining the cockpit walls has been banished for good reason and integrated internal side-pocket rod holders are now standard. Toe space has been moulded into the internal cockpit wall with a complimentary upholstered cushion on the thigh-height gunnels so you can do battle with a secure footing and cushy support. Four stainless steel rod holders are within easy reach in the teak-capped gunnels with another five holders in the overhead rocket launcher. An optional stainless steel bait station adds storage for another five rods with a plastic bait board that can be removed and washed, or set up for draining overboard. 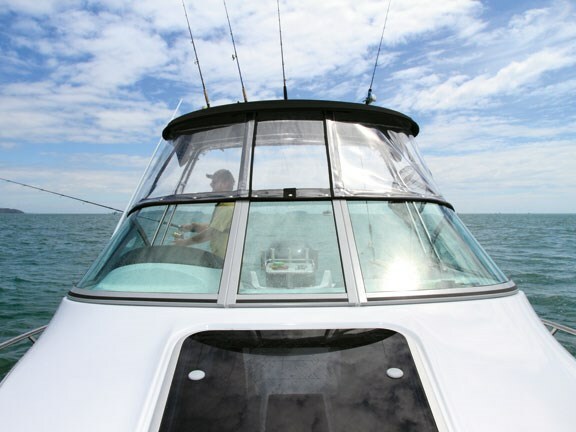 Flush-mounted on the dash is the Lowrance HDS10 which can be viewed from the cockpit while dropping a line over the back. Changing fishing spots is easy with an optional self-launching electric capstan sitting neatly inside the covered anchor well. A removable cockpit carpet can be domed in quickly for a little extra comfort during the floating family picnics. The bait station can also be removed to increase space and liveability though it would be criminal to leave home without at least one rod on the boat just in case you stumble onto a workup. The comfortable cabin features full-length squabs big enough for even the longest legs to stretch out on for an afternoon siesta. An on-board electric toilet was a must for Masefield and Tristram Marine agreed to fit and plumb an electric head into the boat, although a portable toilet is the standard option. A courtesy curtain can also be added for cabin privacy. Four adults can relax in the exceptionally comfortable king/queen helm seats and there's plenty of storage beneath due to the fully-moulded liner. A ski pole is supplied as standard and the internal side-mounted rod holders can also be used as ski holders when required. Climbing back onto the boat should be painless thanks to a recessed boarding ladder located in the Portofino transom. There are plenty of extra little touches to enhance comfort on the water which might go unnoticed. These include catches to hold the seat lids up while digging around in the underseat bins. There's also the folding/sliding underfloor locker lid that will save you a whack on the back of the head when you're reaching in to retrieve items. I met owner and keen fisherman Bruce Masefield at Auckland's Westhaven Marina and added my two fishing rods to the half-dozen he had ready to go. After Masefield demonstrated his single-handed launch technique we headed out onto the Hauraki Gulf for the photo shoot. Of course, we hoped to catch a fish or two for dinner as well. We tucked into the lee of Motuihe for the photo shoot and recorded just over 40-knots in choppy conditions during the performance test. Conundrum had a few more revs up her sleeve but due to the low engine hours we chose not to go there. We tried our luck drifting with soft-baits but the persistent breeze made this style of fishing tough. The boat, however, was comfortable at all times. We spent the majority of the session drifting side-on to the slop but the 641 Offshore's good stability meant this wasn't any bother. Casting room was great for two anglers on board and Masefield says he often fishes with three or four without a hitch. Despite our best efforts the fish weren't biting. Luckily Masefield managed one panny to keep Conundrum's 100 percent success record intact. With all the fishing gear easily stowed away, we headed home with a solid 15-knot push from the stern and an opposing outgoing tide producing a sharp, moderate chop. Despite the difficult conditions the solid hull sat comfortably on 28-knots without any jarring or annoying rattles to complain about. 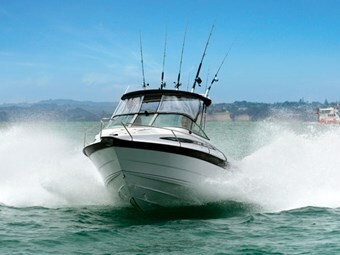 Yamaha's 200hp four-stroke was a great match to the 641hull and had ample power. Hole-shot was impressive and Yamaha's digital gauges provided a wealth of information. 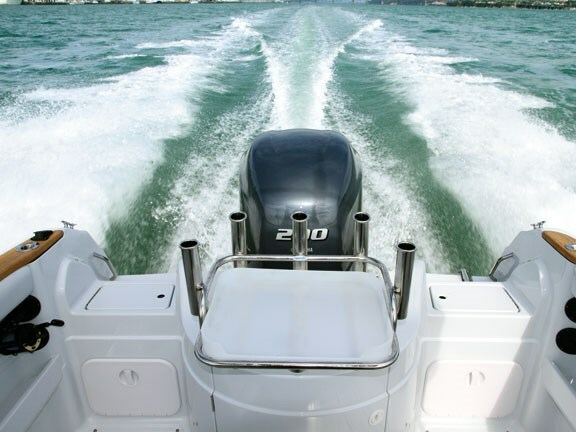 At the hull/outboard's most economical working range of 3500rpm the boat purred along at 24-knots using 24.5-litres of fuel per hour which equates to 1.02-litres per nautical mile — consumption increases slightly above or below 3500rpm. With 150-litres of fuel under the floor, a decent stretch of water can be explored between fills. Although the helm position wasn't adjustable I found it worked very well for my 6'1" frame. The clears decreased vision slightly while standing, but they did a good job of keeping us comfortable. The optional trim tabs were fitted but weren't required. This impressive rig is supplied on a high quality Enduro trailer complete with a freshwater flush system for saltwater boaties. It also features sealed cross-members, equalising leaf suspension and stainless steel brakes. Masefield tows it with a Holden Commodore and opted for the tread plate centre walkway to assist with solo-launching. Tristram Marine's 641 Offshore is a classy performer with a fantastic finish. 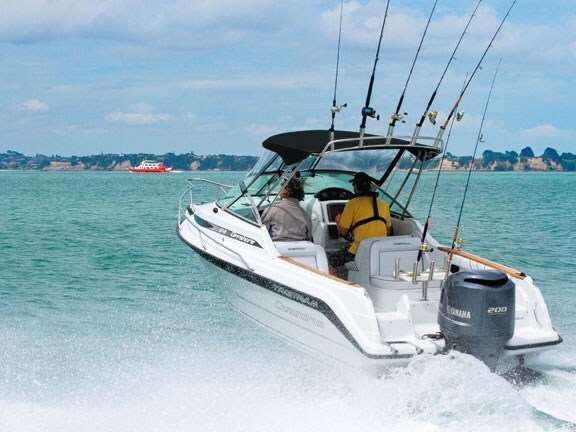 It comes packed with clever features and is versatile enough to comfortably handle serious fishing, time out with the family, water-skiing or even over-night weekend cruising. Tristram Marine's exceptional build quality is evident throughout with an impressive list of standard features that make it a true turn-key package. I was very impressed with this one. For more information on the Tristram 641 Offshore phone 07 849 5225, email sales@tristram.co.nz or visit tristrammarine.co.nz.